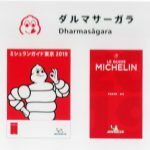 We were elected Michelin Guide Tokyo 2019 Bib Gulman. Prices of Weekday’s Lunch Menu will be a small increase from April 1st. ・We accept credit cards except weekday's lunch time. ・Open Everyday except New Year Holiday. ・We don't take any service charges. We are asking all reservation guests to kindly order at least 1 drink and 1 dish each. Copyright © 2003-2018　ダルマサーガラ　All rights reserved.